Manufacturing and Trading of reciprocating, centrifugal pumps and mobile decontamination systems. Established in the year 1959, we, "Wasp Pumps Pvt. Ltd.", have established ourselves as eminent firms engaged in manufacturing, exporting and supplying a wide range of Reciprocating & Centrifugal Pumps. 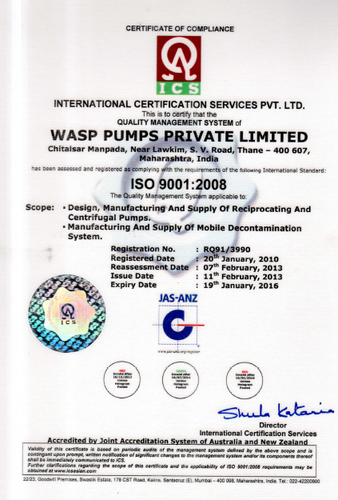 Offered range of pumps has attained us ISO 9001:2008 certification consisting of Triplex Reciprocating Pumps, Ejecto Centrifugal Pumps and Bulldozer Series Single Piston Reciprocating Pumps. The offered products are designed and manufactured with the help of our highly skilled and experienced workforce in tune with the specifications detailed by our customers. Offered products are highly demanded by our patrons for their sturdy construction, less maintenance and easy installation. Offered range are used in many application like industrial cleaning, sewer jetting, dust suppression, hydrostatic testing, piling or guniting, high pressure impregnation and decontamination. Supported by a group of highly experienced and well-trained professionals, we have been able to operate our business operations in a highly effective manner. Our team of professionals is well-versed with top notch technology with utilizing the tools and upgraded machines installed in our infrastructure unit. All offered pumps are manufactured in our sophisticated manufacturing facility in tune with the industry defined quality norms. Moreover, we have recruited highly diligent quality professionals who stringently examine offered products before prior dispatch to our clients. Furthermore, we exporting these pumps in Gulf country. Supported by our well qualified mentor, “Mr. Pankaj G. Shukla”, we have been able to gain such a rapid growth in the market. Under his valuable supervision, we have created a broad client-base owing to his great managerial skills, business acumen and ability to take random decisions with optimum accuracy. To manufacture the offered collection of the reciprocating & centrifugal pumps, we have developed a top notch infrastructure facility at our premises. Our infrastructure unit is laced by all the required machines for the manufacturing process of the offered products. With the help of our well developed infrastructure facility, fabrication of the offered products is done in such a rate that we are able to cater the bulk order demands on time. We are among the popular organizations in this field; we are manufacturing all our offered products as per the predefined industry norms. Owing to our customized approach, we are one of the best possible options available across the market for the offered range of pumps. We are ISO Certification company. We have appointed a team of highly experienced professionals which helped us to manufacture, export and supply the offered range of reciprocating & centrifugal pumps in a best possible manner. Our every professional is master of his respective domain. We have allotted them various tasks as per their area of expertise and offer high flexibility so that they can perform in a highly productive method. Our team is capable to fulfill the ever changing demands of our valued customers and helps us to face the growing challenges of the industry.